As I confessed in a previous post, I am darn near obsessed with rolling out new iterations of Chex Mix. My adored late mother is, no doubt, doing her own share of rolling–as in rolling over–because she prefered classic, unadulterated versions of virtually all recipes, including her hallowed Texas Trash (aka Chex Mix) which made its annual appearance only at Christmas. With new traditions the focus this Christmas, the second without her or my similarly adored late husband, I never made the Chex Mix, but I have been making up for it ever since with the creation of recipes for Taco-Fajita Chex Mix, Asian Chex Mix, Thai Chex Mix and, now, Mesquite BBQ. The latter is COMPLETELY different from BBQ potato chips of which I am not a fan, as I find the flavor overpowering. My Chex Mix is more subtle and complex. If you are a purist when it comes to whole foods, fresh herbs, and shopping the perimeter of the grocery store–as I usually am–allow me to introduce you to the spice mix aisle where the McCormick brand rules in my local Kroger, though there are others. It is a treasure trove of inspiration for, in my case, Chex Mix. Perhaps my greatest contribution to the world of Chex Mix is the addition of ingredients not typically found in these mixes, e.g. Earth Balance “Cheddar” Crackers, French’s Crispy Onions (of green bean casserole fame), and Potato Sicks (my Asian versions include the likes of Chow Mein noodles, sesame sticks, and wasabi peas). 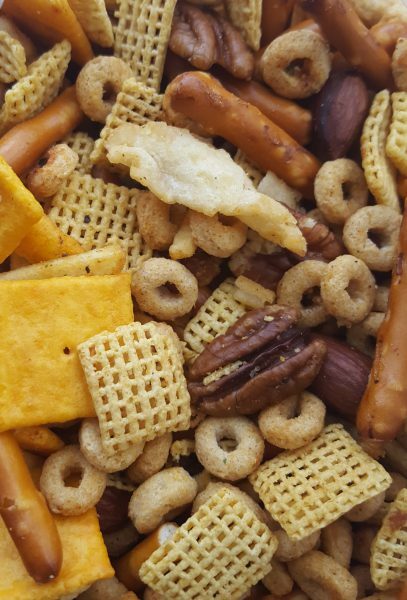 For this variety, I chose Corn Chex, as cornbread is the perfect accompaniment to (vegan) BBQ; Cheerios and pretzels because I love the contrast of shape and texture; “cheese” crackers, potato sticks, and crispy onions because, when I was a vegetarian in Nashville, I loved a potato, onion and cheese side dish with a crispy topping at the local BBQ joint; and pecans because I associate them with Texas and the south where BBQ rules. But, I added some smoked almonds too because there is no such thing as too many nuts and because the smokiness is perfect in this BBQ-inspired iteration. Choosing spice packets was challenging because of the many options. Select whatever sound good–just check the ingredients list for whey and the like–but I ultimately decided on the combination of a mequite and a brown sugar-bourbon variety for a balance of spices, flavors–including tomoato–,smokiness, and just a hint of molasses-y sweetness. Preheat oven to 250 degrees. Place butter in large roasting pan and place pan in oven for a few minutes or until butter is melted. Whisk in spice mix. Then stir in all remaining ingredients in succession, gently stirring after each addition to coat with the butter mixture. Roast for 60 minutes, gently stirring up from the bottom every 15 minutes. Remove from oven, stir well, allow to cool completely–it will crisp even more as it cools–and package for eating or giving. Note: I don’t find the mixture too buttery for an indulgent snack, but if you prefer to absorb a little of the oil, spread the mixture on brown paper bags or paper towels to cool. Blooming Platter “Vegan ‘Pulled’ Spaghetti Squash Barbecue” Featured on KitchenTreaty.com! Hi all! I’ve been on vacation for 5 days and have missed cooking and posting. But I was delighted to return home and find a pingback related to my Vegan “Pulled” Spaghetti Squash. Evidently, it had been featured by Karen Troughton on KitchenTreaty in 2012. I don’t know much about this site other than what the tagline says “Vegetarians and Meat-Eaters CAN Live Together.” But, regardless, thanks Karen! As it happens, I found my mouth watering at the aroma of barbecue in the Houston International airport yesterday on our way home from (fabulous!) Aspen. So, it seems that the universe is telling me that I need to remind readers about this recipe for summer BBQ enjoyment! 1) That Karen created her own sauce recipe. It contains a far shorter list of ingredients than mine but, trust me, I tweaked the flavor profile so that, at least to my palate, it is perfect! And the only extra time involved is opening a few more spice jars. The resulting sauce is well worth a tiny bit of extra effort. So I wouldn’t tinker with my recipe unless you have a BBQ sauce that is your absolute favorite. I thought that my vegan version of “pulled” barbecue plus tradition-trimmings-with-a-twist looked so pretty as an appetizer that I wanted to share this photo. For the recipes, just type this recipe title in the search box or scroll down four posts. My pal, Katherine Jackson, requested a veg version of pulled pork barbecue. When I told her she had me stumped (because I wasn’t sure how I could shred something like seitan in a home kitchen), she suggested spaghetti squash. I thought that was a brilliant idea. And I hope you agree. 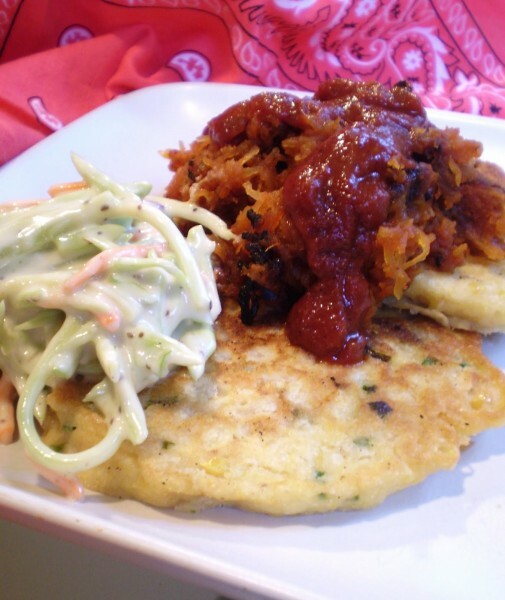 But, for me, no barbecue meal is complete without the counterpoints of crispy-creamy cole slaw and tender “buttery” corn cakes, so I added those to the mix. I think you’ll love this trifecta of tastes. Here’s to you, Katherine, for providing great inspiration! Stir all together and heat gently until simmering. Simmer for just a few minutes to let flavors combine. Store, covered, in refrigerator.